Well time for a FAQ. I've had tons of people asking mom and me about me lately. So let's start and we can edit it over time. What are you? 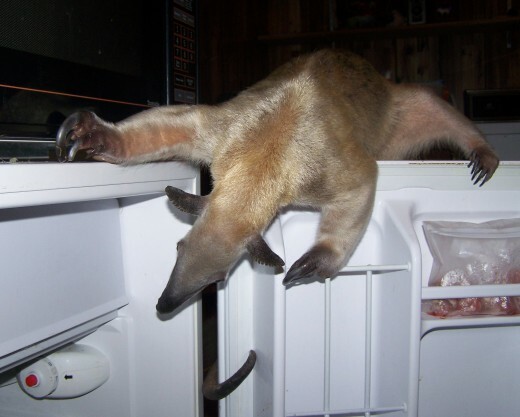 I am an anteater. I am a tamandua. Tamandua Tetradactyla to be precise. 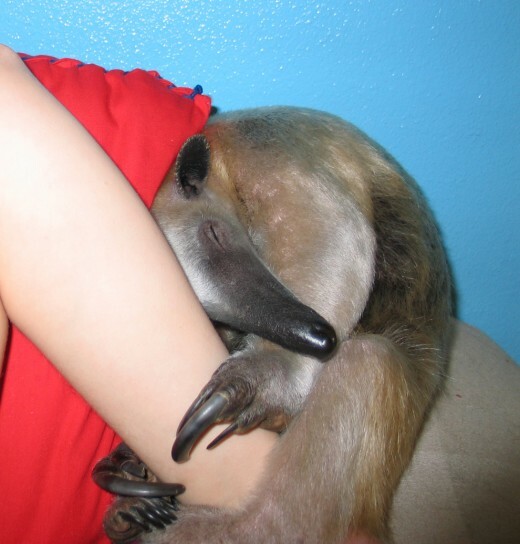 Some will call us the lesser anteaters but we are the PERFECT anteaters. Giant anteaters are to big that's why they are called giants. Pygmy anteaters are too small and that's why they are called pygmies. Tamanduas are in between and just right. Any relation to aardvarks? No. We are most closely related to sloths and armadillos we share our own Supper Order with them and true anteaters have our own family. Others are mere imitations sharing a similar diet. Are you legal? Yes. All laws were followed in my coming to my new home. Laws where you are may be different. Each country, sate, county, and city all have laws that may stand in the way if you want to bring an exotic animal home. Please check the laws at all levels. How do I get one? How did you get one? Where do you get one? Ect. If you think you want one and the first question you ask is how to get one, You should not have one! There are a million other questions to ask first. It can be hard to find a vet who will treat us much less one that knows anything about us. We could be killed or made sick with the wrong medicines, like some antibiotics. You will need a vet. We are known to those in the know as "delicate keepers" When we get ill it is always as unusual as we are and leaves even good vets scratching their heads. We are demanding. We need lots of attention. Our pee smells skunky. Diet is SO important and you need to do a lot of research to be sure you're doing it right. You thought feeding a dog could be hard with all the different kibbles, canned, home cooked, store bought cooked, store bought raw, home made raw, ect. We'll it's much more involved with us. And so much more you must know FIRST. Why would you want to bring home an animal and have no idea what to feed or how to care for us or how destructive ect we may be and have us die or need rehomed because we peed the carpet and made the place smell and the landlord got mad and your friends stopped coming over, or whatever? Please do your homework first you will likely change your mind. Mom loves us despite and because of all our quirks but mom is weird. What do they cost Tamanduas go from 5,000 to 8,000. Those are the prices mom has seen. You pay more for tame healthy young ones as a general rule. Prices tend to keep going up. Their are not many of us around and getting harder to find with few breeders and then only a baby every couple years with a successful pairing. There are some from the wild like me, Pua, too but you REALLY must know what your are getting into and have solid animal and exotic experience first. It's not easy to deal with a sick tam strait from the wild and they will be sick. Okay I don't want one but I'm still curious where you came from and WHY your mom has you? Ha HA do you have a pet, dog, cat, hamster? Why do you have it? You just wanted it right? Well, there you go. When mom was looking at places to move she found a list of things you can have in the state we live now and tamanduas were on it. She saw one on TV once dressed up in a snow suit. So she started learning about us. The more she learned the more she liked and then loved us. She spent years learning about us and has not stopped trying to learn all she can. It was with a lot of determination she got me. I came from Guyana, South America. It took mom over a year of trying to get me. I was very ill and wouldn't have survived in the wild. Mom wasn't sure I'd survive with her but she nursed me back to health and I'm grateful. I'll even admit here. One time I slipped out on my own and came back an hour later. I love it here. Stewie was born in FL so he always lived this easy life. He even was a little scared of outside but liked to doze in an open window and sniff. He left his mom and went to live with a family in Ohio but he couldn't stay due to health issues in the family and he came here instead. He just came here by luck. I'm here by destiny. RIP my love. Aurora, someone tried to import illegally and she was seized and subsequently placed here. It's a miracle she survived the many days locked in a little crate shipped around surrounded my scary noises. She's a tough nut but now has adrenal insufficiency(Addison's) because of it. What do you eat(besides ants), or how do you get enough ants to feed them Mom goes out and gets us ants or we find them on walks but they are mostly just treats, she now also orders them in bulk once a year from China. If you were paying attention so far you'll have noticed I mentioned the importance of diet before. Mom did a lot of research on that and has recipes from zoos and keepers all over the world. She made us up a mix based on a study of the analysis of stomach contents of our wild kin. It was adjusted more over time and with more research. I get a mix of raw ground beef, wheat bran, spinach or thyme and and some other things. We decided we REALLY love beef so mom accommodated us with a diet change. We need the spinach or thyme for vitamin K or we are hemophiliacs and flax and wheat bran for fiber. Stewie loved fruit and fruity things but too much sugar is bad for us. We both adore blue cheese. Many who have had issues with their tamandua have seen great results by using the beef diet. A breeder has also reported a baby boom once they used it. Are they like a dog or a cat? UH excuse me? Do I look like I bark or meow? No thank you. But if I must compare I'd say a cat. We are very loving but we will not stay and cuddle just because you ask. We do love to cuddle and snuggle. I sometimes cry if mom's not there when I want her. Stewie was not as clinging and was more likely to stay and snuggle if you asked him right. When is the last time a cat stuck it's tongue up your nose or gave you a french kiss though, hmm? I'm not to fond of toys but Stewie liked them a bit more. I have played with kitty toys and tennis balls and rubber things in the past. Stewie liked stuff more than me. I just like to play and explore and go for long walks and cuddle with mom. We like to play fight and wrestle. Some of the boys through here liked playing wrestle with stuffed animals. Aurora only plays with me she does not like humans and has never warmed up like others, mom thinks she was mishandled in the past. The newspaper lady asked about anything specifically anteater We have a social ritual of hand and foot poking. Even on the ride home from the airport. Me strait from the wild. I took mom's finger and squeezed it and gave her friendly pokes. I like my hands squeezed too. Stewie and I did this to each other. All of us do. What sounds do you make? We talk through our nose so most of what we say comes out as different sort of hisses you need to learn to interpret. We cry and weep. We hiss in madness, annoyance, confusion, ect. We grunt, whine, and if someone did something really horrible to us we might scream but neither of us here have done that around mom. We also growl. Mom says it sounds like little dinosaur growls. Babies make a kind of chirping noises and squawk and twirr. Aurora got so happy one time she ran around the room beeping. Do they hurt you with those long nails? What about the furniture? I'm proud to say I'm very gentle with mom and always have been and I don't claw the furniture. Stewie is another matter. He learned to be gentle but liked to use his claws on most anything. He did claw holes in the wall when upset when I was ill and liked to claw the furniture but later was content with the throw rugs and cat condo. We like to tear things up when given the chance like coconuts and logs. Aurora is especially hard on the walls, she claws at them if her food is not just right. Most tamandua will need to be taught to be gentle when playing. We like to play fight and grab kind of like cats. Aurora also got onto the molding by the ceiling and was hanging from it and it broke loose. Injuries. There have been a few, all human error. Grabbing me when I was scared and not letting me know it was her first. Letting me play grab at her head, opps. And two errors with Stewie. We respect flesh long sleeves and other objects are not flesh. We use our nails as fingers and when too long can grab too hard by accident. Mom was waving a rug at Stewie and his claws were over do for a filing and oops again he missed it and got her (ouch). We've never done major damage, just little holes at our worst. Mostly just kitty scratches. But all in all we are not bad. We've done nothing that can't happen with a domestic dog or cat, when playing to ruff or scared or injured too. How smart are they? We are very smart. We know how to open the fridge, open the doors, open the window, open drawers, open cabinets, open containers, climb the door frame, respond to my name. I respond to my name and Stewie responded to my name too, ha. I leaned to come to a squeaker for a treat and follow a target but when I am outside I am too excited to care about any of that. What do they do? We play wrestle and battle and footsies, we hug and cuddle and kiss and groom. We go for long walks in the woods. We run around the house and just hang out too. Are you house trained? Are you? Well we wild tams like to use a latrine and so we are good about house habits well I was. I use washable pee pads and though our pee is skunky it's manageable with keeping those picked up and things washed. We do sometimes like to mark out territory and try to get away with peeing in places outside of our room in the rest of the house but not to often. But then Aurora arrived. She wets the bed. I decided if she was doing it that's fine by me too but I like to pee in a different bed than the one I'm sleeping in. Though I will also use my "outhouse" which is like a big blanket fort with a pee pad in there or recently mom put a pan of shavings instead. We like to always poop in the same place and preffer to do it from a perch somewhere. So just tossing a pad down where we like to go to catch that is great. We do tend to dribble tinny bits of urine sort of like a mouse or rat does but not constantly and more so in a new place or if we are feeling insecure. There doesn't seem to be any real odor issues with this. At least to the human noses of our family. A lot of us do pee our beds. We like things that smell like us. How are they with other animals? I've never heard of an aggressive tam. You leave us alone we will leave you alone. We're not fond of the other animals but we just ignore or avoid them. The dogs think our tails are scary. We will all sleep next to each other when in mom's bed. Here's some basics on Tamandua keeping but the care sheet is much more detailed. Smell: Tamandua have a strong skunky odor. Most of the smell is their urine but they have some body odor and give off more scent when stressed. Many find them too smelly for house pets. Their feces also has a strong smell. Plus side they poop once ever couple days on average, quick thorough clean up minimizes the odor. Interaction: Tamandua love to play but need to learn to play gently as they use their claws and grab, kind of like playing with a cat. They love to cuddle on their terms and some will sleep in bed with you. They love to run so should be walked once a week when weather allows. They need at least a 2-3 hours play with their owners or a friend of their own kind(subspecies clash). * They tend to be very nocturnal and can get up very late, sometimes not till after midnight. Most will wake for a fun day time walk but otherwise wont adjust well to a daytime schedule though the young are awake during the day more, they lose that as they grow up. Plus: sleeping all day means there is no day time care to worry about aside from morning clean up and static things, like keeping them warm. Enclosure: Should be high since they are arboreal 8 to 10 feet high. Floor space 10X10 bare minimum. 15X20 recommended as they love to run. Include hammocks, nest boxes and lots of things to climb on, toys and old logs. Can be kept as house pets but will need a large room. If sharing the room with their owner a cage no smaller than 5X5X6 can be used for short periods of time but is not suitable for long term living(use for time outs, and acclimation when they first arrive), they need more space than this when awake so should be out at night. They really hate being caged. They will spend all waking time trying to get out of a cage so a whole room or large enclosure is preferred. * Must be kept warm 65 minimum for living but should be 70-80. Outside of those ranges can be unhealthy for them though walks in the 50s to 90 are tolerated by most. For this reason in most climates they will need a large indoor enclosure as well as some outside space for nice days. ** Extra steps need to be taken to make an enclosure secure.They are escape artists and can claw through wood and some have been said to claw through concrete though it would take them some time. They can squeeze through very small spaces for their size and can learn to open doors. Stewie once ripped a bar off his cage when in time out and slipped out the small hole. Cost: $5,000-$8,000USD Price varies some by subspecies and age. Color Variety: There are two subspecies common in the pet trade at the moment. The Paraguayan sourced vested, Tamandua Tetradactyla Straminea. These come in golden with black vest or all golden. 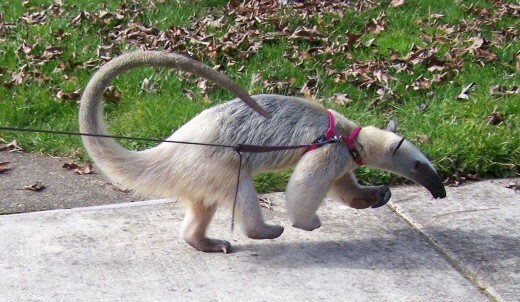 The Guyana sourced non-vested, Tamandua Tetradactyla Longicaudata, these come in a sandy blond with light tan vest or all light blond(platinum or reddish strawberry blond). All blond types are fairly rare. All black exists in both subspecies but are not available in the pet trade at this time. Male/female: Males are more out going while females are more one person animals, though females tend to be more affectionate. Females can be a bit moody due to cycling monthly(40 day average). Females do spot blood for 3 or more days each cycle. Males are not as easily potty trained as they are more inclined to spread their scent around. 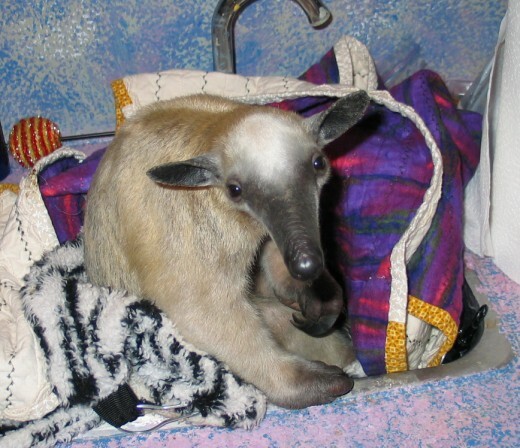 Tamandua should never be spayed or neutered due to the risks and is not really needed for temperament. Maintenance: Tamandua are considered delicate keepers. They are prone to parasites which can kill if not treated. They need a complicated and fairly expensive diet. Small issues with the diet can cause serious health problems like bleeding or eventual paralysis. Even when on the right diet illnesses can be accompanied by bleeding and clotting issues. Illnesses are often mysterious and or dire. A great vet is vital. Some veterinary knowledge by the keeper is vital. If humidly is lacking you may need to oil their ears and tail. Claw trimming or filing is often needed but they often can self maintain if given enough things to claw at and climb as the claws will shed but they then will also be very sharp. No brushing is usually needed but occasional baths are tolerated if a house pet, non-house pets may never need bathed if misted, allowed in the rain or water is available when warm enough. Some people are allergic to tamandua. They produce a lot of dander, especially in dry climates. Contact allergies, where they make you itchy, are most common. I made mom really itchy at first but she grew tolerant of me. I get a bath when I start making her itchy or have a lot of skin film, these usually coincide, about ever 3 months or so now, used to be monthly. We do a good job keeping ourselves groomed.